HandHRanch: Fence Project: Part 1 of ?? Mr. HH is starting a fence project on the big east pasture. Well, right now it is more of a demolition project as he tears down old fences, removes old windmills, takes down about 100 cow panels, and generally tries to make this place look less like a run-down dairy farm. Oh, wait! It WAS a run-down dairy farm, and then we bought it – lucky us. If anyone ever needs any bent up gates, rusted out feeders, or random unidentified piles of twisted metal, you let me know, because I can HOOK YOU UP. Every time the cows graze down a new part of the pasture, we find some new rust skeleton. I’ll try not to write too many boring stories about chores like this, but there is always something unexpected whenever a project gets going on the ranch. When one of the feeders is finally hooked on to the tractor and starts moving, out comes a HUGE packrat! And what do we do? Why, stand and laugh as he runs around like crazy trying to figure out where the heck his house went, of course. 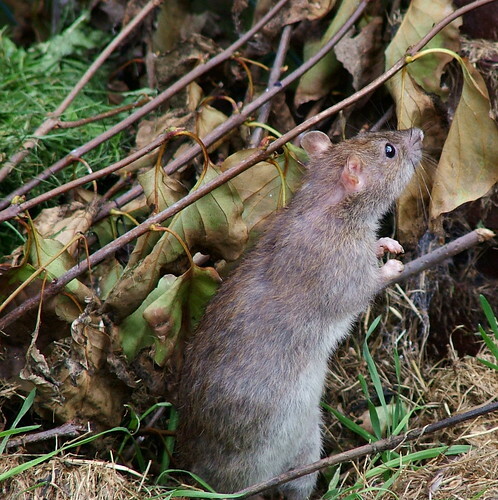 Did you know rats hop when they are agitated? This guy looked like he was on a pogo stick. No, I did not have my camera, I took it off after it tried to hang me when I was climbing fences. Don’t ask. So here’s a picture of a rat about half the size of our feeder-rat. Now the other feeder did not have a rat, instead it had a big fluffy skunk living under it. This is where experience is helpful. Mr. HH and I were both outside the tractor, and seeing that skunk was like lighting a fire under us, we both sprinted upwind like we were being chased by a pack of wolves. If you have not smelled skunk at close range before, you might not know just how important speed and wind direction are in such situations. Remember that kids, it might come in useful someday. Anyway, Dad was left in the tractor wondering where everybody went so fast. 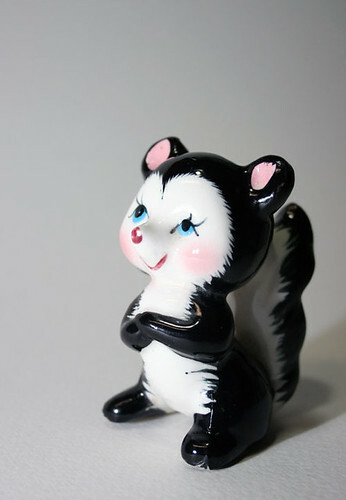 This next visual aide is the cutest picture of a skunk I could find. (apparently everyone else has the same response we did, and no one hangs around to take pictures, right?) I think skunk cuteness is one of nature’s cruel cruel tricks. I mean, look at those adorable fuzzy tails, don’t you just want to pet them? I’ll have to have Mr. HH tell the story of how that works out. Step away from the skunk! So to summarize: old dairy equipment = useless, bent, and rusty; big nasty rat = funny; and cute fuzzy skunk = run like the wind! This concludes our nature lesson for the day. Class dismissed.